Remove lingering cigar and cigarette odors with our newest smoke eater. With seven stages of ADVANCED purification, the Summit PLUS tackles even the heaviest smoke. To beak down smoke particles at the molecular level, our ozone purification stage can be activated to emit trace amounts of activated oxygen that completely eliminates the smoke particulates it comes in contact with. Utilizing the unit's Purify feature, simply activate the ozone stage before you leave your home and/or office and enjoy fresh and clear air upon your return. While the ozone feature eliminates smoke, the other six stages work in concert to transform the air you breathe through UV sterilization, absorption of smells and toxins, and removal of 99.9% of airborne contaminants. The result is clean and fresh smelling air that few other air purification systems can deliver. No longer will you need to worry about cigar or cigarette smoke that can be left behind long after the smoking has stopped. Our air purifier removes such stenches, while even pulling smoke odor out of carpet and upholstery. What remains is an odor-free home that you will surely enjoy. 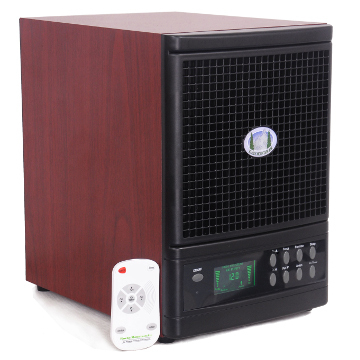 We are so confident that you will thoroughly enjoy your air purifer that we even offer a 60-day money back guarantee to ensure that you are 100% satisfied with your new smoke eater. See how the Summit removes cigarette smoke with ease! Tough to eleminate ordors, like cigar smoke, get erradicated in a matter of minutes. Watch these amazing videos to see for yourself!